Rhythm of Praise festival 2017 live in Bauchi with Pst Jerry Ogbeba a live recording of his (Thank You Project), it's going to be an atmosphere of Praise and Fire...its going to be an Encounter with heaven. 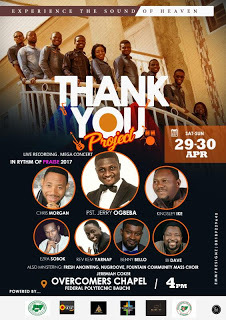 Thank You Project (TYP) is a live recording mega concert with Pst Jerry Ogbeba & Fresh Anointing. 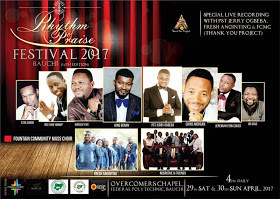 The TYP live recording would take place during the 14th Edition of the Rhythm of Praise Festival, an annual Prasie event. Venue: Overcomers Chapel Federal Polytechnic Bauchi.